A couple of Kotaku staffers love Danganronpa, the weirdly named Japanese visual novels/murder mysteries released on the Vita in the U.S. this year. I figured I should try one by year's end. I knew going in that I was in for a rough time. WARNING: This post contains major spoilers about what happens in Dangonronpa's first chapter. The last thing I'm looking for in my gaming life are games—or visual novels—about decidedly average teenage boys who can't express their emotions, are surrounded by walking cliches (the nerdy boy, the clothes-crazy girl, the joke, the biker dude, etc) and yet who are destined to save the world. I don't relate to that shtick and usually have trouble with games like that, many of them Japanese-made and clearly playing to a type of audience that I'm not. I respect that people love it. But it's not what I'm looking for. All that said, I greatly respect my colleague Kirk Hamilton's taste in games. And while our own Jason Schreier and I don't have similar taste in games—he loves a lot of JRPGs that are thick with the kind of stories I don't care much for—I wanted to at least try a game that Jason and Kirk both love. I tried the first Danganronpa on Sunday. I'd asked Kirk how much time it'd take me to get into it. About two hours, he guessed. Stephen: Nearly two hours in, and all I have been doing is tapping the x button to talk to a bunch of Japanese teenager tropes. I do not get how you can put up with this, let alone like it! Stephen: Well, she bought it. Shocker. Stephen: Is Persona like this, too? Kirk: No, Persona's writing is far better. 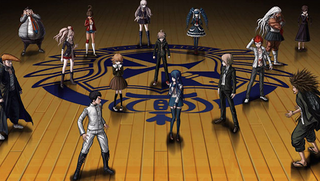 There's a certain tawdriness to Danganronpa that grew on me over time, but I understand why it's not your thing. Stephen: These tropes, mainly the idea of the young male protagonist who can't express his own emotions, are all over some of the Final Fantasys I have played, too. But this game just makes me miss Bully more. I suppose it would get more interesting as more characters die, but I cannot stand the lead character and the tropes in games like this. Kirk: Persona's on another level, though, in terms of characters/dialogue/world/etc. Danganronpa's main appeal for me is twofold: 1) whodunnit? for each murder and 2) what's happening? for the overarching mystery. The murder mysteries are very good. They're a big improvement over Phoenix Wright, and the trials are cool. Stephen: She wrote Leon's name on the wall. Man, is the game this obvious? I can read upside down numbers as names! Stephen: How do you get a trial to start? I've gathered a ton of clues during the investigation mode. Kirk: You have to get all the clues, and it'll start automatically. Stephen: I'm in the trial now and am very confused about the controls. I keep trying to fire a truth bullet but it doesn't work. Am I supposed to be aiming at the person? I don't get this. Stephen: Ohhhh. [I'm supposed to be shooting at] the words! Kirk: Haha. There you go. I'm enjoying picturing you playing this game with a constant frown, regularly rolling your eyes and reaching for your phone. GOTY 2014!! Stephen: The trial mechanics are interesting. Do the trials get more complex? Kirk: The general format remains the same, but the mysteries get much more complex. So, in that way, yeah they get more complex. Also, I think it does keep introducing new mechanics for the first 4 trials or so. Stephen: I'm intrigued by the skill system. You get skills by chatting? Kirk: It...doesn't amount to much, unfortunately. But yeah that's the gist. It's to encourage you to do the social stuff during "free time" between each investigation/trial. You might have to take my word for it that the characters actually all get fleshed out and become interesting and likable (though still exaggerated) as you go, but it's true! Stephen: Well I liked that this pop singer girl was actually trying to murder. Stephen: Have you played the most recent Ace Attorney? (Not the Layton one). I know Jason loved it. How does this compare? Stephen: I liked the first Phoenix Wrights but became dissatisfied with the shallowness of the trial gameplay. Kirk: Right. That carries through in the new one. The challenge is that [in Phoenix Wright] you can't actually solve the case before trial, where in Danganronpa, as you go, you'll get good at paying attention to clues, figuring out who doesn't have an alibi, and anticipating red herrings. You can solve cases before trial. It annoys me how in Phoenix Wright it's like, "oh, actually the prosecutor has a new witness and a ton of new evidence that you've never seen and changes everything about the case mid-trial, surprise!" Stephen: Yeah. I like the characters in those games better—based on what I've played so far of that series and this game—but maybe I'll be surprised! I will put this game down after this trial but I now am intrigued enough to want to eventually get back to it. Stephen: Ok. Well it only took six hours for this game to grow on me! Trial one complete. I'll start Bayonetta 2 after dinner.